This interactive presentation contains the latest oil & gas production data from all (12163) horizontal wells in North Dakota since 2005, through December 2016. Just two months after North Dakota saw the biggest rise in oil production in its history, it experienced the steepest decline. Total oil production in December came in at 942 kbo/d, down by 92 kbo/d from the previous month. Severe winter weather impaired completion operations, and extra wells were shut-in. January was also a harsh month, so I don’t expect a reversal very soon. Still, a sizeable number of new wells came online, 82, vs 83 in November (see “Well status” tab) . Of the top operators, only EOG was able to increase production in December, as the last overview shows. This “Ultimate recovery” overview shows towards which ultimate recovery wells from the past several years are heading. I’ve deselected Bowman county, which includes some excellent, but conventional, horizontal wells. Without this county, the increase in performance in real Bakken wells over the last decade becomes visible. In recent years this improvement has stagnated, although initial recovery is still increasing, as the higher tops (indicating higher production rates) show. If you’re interested in more recent performance, please choose to show production by “Quarter” or “month of first flow”. In the 2nd tab (“Cumulative production ranking”), you can see all those 11937 horizontal wells outside of Bowman county, ranked by cumulative production; 5 of them have produced more than 1 million barrels of oil through last December, while 169 produced so far more than 500 thousand barrels of oil. [Update] Although I planned the new Projections post for this week, I received some good suggestions for improvements on a preliminary version. I now plan to release this post coming Monday. DMR of North Dakota. These presentations only show the production from horizontal wells; a small amount (about 30 kbo/d) still comes from conventional vertical wells. You can click through the blocks on the top to see the slides. Each slide has filters that can be set, e.g. to select individual or groups of operators. You can first click “all” to deselect all items. You have to click the “apply” button at the bottom to enforce the changes. After that, click anywhere on the presentation. Tooltips are shown by just hovering the mouse over parts of the presentation. You can move the map around, and zoom in/out. By clicking on the legend you can highlight selected items. Note that filters have to be set for each tab separately. The operator who currently owns the well is designated by “operator (current)”. The operator who operated a well in a past month is designated by “operator (actual)”. This distinction is useful when the ownership of a well changed over time. If you have any questions on how to use the interactivity, or how to analyze specific questions, please don’t hesitate to ask. I wonder if anyone could comment on the shut-in effect for non-conventional and conventional oil/gas wells? I read from some places that shut-in for a period of time will hurt conventional oil wells. I also read that in Bakken, shut-in are quite common for unconventional wells and sometimes a short shut in could bring up the production significantly? 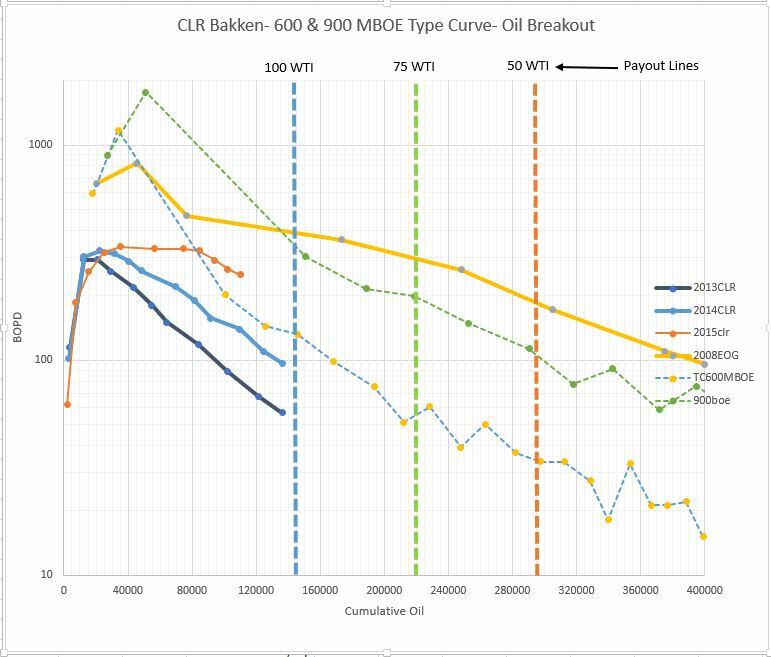 If there is a big difference for shut-in to be used in unconventional versus conventional wells, then it might explain why CLR and Whitting could have up and down swings in Bakken lately? CLR has +-15% swing. If this is true, shale driller could in theory have a better control of oil and gas production and market as well. Updated my Continental Resources Type Curve to Actual this morning with Enno’s new data. Added a 900 MBOE curve, by simpling taking the 2012 600 MBOE curve and multiplying it by 1.5. I think that is the type curve amount they are now using. I wish to again point out the difference in decline shape for oil and gas here in Bakken. The gas decline shows remarkable improvement over the time (year by year) and also very obvious 2nd slower decline phase; while the oil shows much reduced improvement to no improvement over the time and also the 2nd slow decline phase is getting weaker. This dramatic improvements over the time with ever bigger mega fracking really only apply for the IP of oil and also gas EUR, but not oil EUR. This makes me suspect that ever bigger mega frack only favors the release of light oil which is in gas phase underground along with gases. The fluid dynamics probably explains why this happened. also, as the light oil and gases in the tight reservoir rocks are coming out much more easily, the pressure of the matrix drops fast, and this result in the separation of oil and gas, resulting higher and higher GOR, which is quite obviously in the trend plot here generated by Enno. I wonder if there is an observation that the API of Bakken oil also dropped as mega fracking becoming bigger and bigger? Thank you for your comments Sheng. I’ve also noted the pretty rapid increase in GOR in the Bakken: it has increased overall by 50% in the 2 years from Dec 2014 until Dec 2016. That makes it even more important in my opinion to separate oil & gas when analyzing these businesses (instead of using “BOE”). I will hesitate to draw a conclusion until I confirm on welldatabase.com! Jim, I’d forgo welldatabase.com and go straight to Seeking Alpha. there seems to be a mismatch for the wells started in 2005 and 2006.
in the top “well quality” plots, you could see wells started in 2005,2006 and 2007 actually produced over 200K BO on average; while in the lower plots of production rate versus total production, these 2006 and 2007 wells stopped at before 150 and 200K BO. 1) I sometimes change the default selection in the view, to highlight something in my post. In this case, I disabled the “Bowman” county in the “Ultimate Recovery” overview, while it is still included in the “Well Quality” overview. This county contains many excellent, conventional, horizontal wells. I recommend to exclude them, and I am considering to filter them out of the data completely. 2) The “Well quality” also shows incomplete tails: e.g. the Jan 2007 wells have 11 more months of production than the Dec 2007 wells. In the “Well Quality” overview, these Jan 2007 wells are shown at the very end of the 2007 vintage curve; they are the only 2007 wells that produced 120 months on production, and therefore the 11-months tails become ever thinner as there are ever fewer wells included. In the “Ultimate Recovery” overview, due to certain other reasons, I exclude these incomplete tails, so you will see that the end of the 2007 vintage here has only 109 months of production. I understand this is not so intuitive, but I think describing how it works is better than trying to change this. Let me know if this is clear, and solves the issue. Upload attachment (Allowed file types: jpg, gif, png, maximum file size: 32MB. Get access to our latest ShaleProfile Insight report which covers the 2 major oil basins in New Mexico & Texas: The Eagle Ford and the Permian. In this report, we discuss the latest drilling activity, well productivity, total oil & gas production, typical production profiles, and who the leading operators are. Sign up now and receive regular updates.